"The Prince of Wales Perpetual Trophy for Woodland Management"
to Simon and Katherine Lenihan. An award has been launched by the British Horse Loggers. A recent piece of work which has included the use of horses to extract the timber will be nominated. Judging will be stringent and will evaluate the job as a whole, from planning to finish. The BHLWMA will highlight the quality of woodland care and woodland management that can be achieved by the use of horses and there will be a prestigious and coveted prize for the winner, the 'Prince of Wales Perpetual Trophy for Woodland Management', as well as prizes for 1st, 2nd and 3rd placed. First place is awarded to Simon Lenihan for his acclaimed work at Tarn Hows nr Coniston in Cumbria for the National Trust. The judges commented,"The work was carried out when conditions were very wet. Taking into consideration the ground conditions, and the size of the timber moved, the absence of any ground damage is impressive". Second place is awarded to Frankie Woodgate for her high quality work in Wooton Coppice, nr Brockenhurst in Hampshire for the Forestry Commission. The judges commented, "This is clearly a wet area of woodland but the absence of signs of extraction damage points to the success of the horse logging operation". Third place is awarded to Doug Joiner for his long term involvement in the privately owned Childer Wood and Meephill Coppice, Nr. Ledbury in Herefordshire. The judges commented,"The woodland is well visited by people attending the various courses that Doug runs and so horse logging is well and truly promoted via his efforts at this woodland". 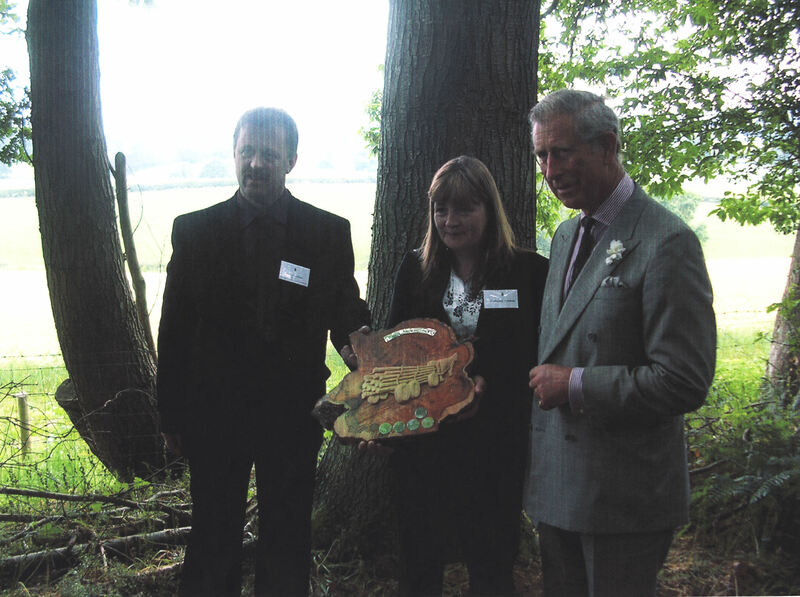 "Judging the inaugural British Horse Loggers' Woodland Management Award has been an extremely rewarding exercise. We have been greatly impressed by all five entries, making the decision of how to award a first, second and third prize a most difficult task. Every entry must be commended; certainly we have come away from our judging feeling that horse logging is currently being practised by some true enthusiasts who are certainly raising the profile of, and professionalism amongst, the horse logging fraternity. We would feel confident in inviting any of the entrants to work in the woodlands that we are responsible for managing". Turning back the clock at Tarn Hows Terry Fletcher sees how one of Lakeland's most popular visitor spots is being given a makeover. Click Here to see the full article published Sept 2004. Hoof power pulls its weight in clearances Terry Fletcher finds a quiet revolution taking place in Thirlmere. Seeing is beliving...writes photographer and roving reporter Charles Sainsbury-Plaice Horse Logging Demonstration - July 10th Ladock Woods, Corwall. Horse power on cartmel fell...Sultan is hauling away at a giant trunk and making light work of it. The sight of the horse straining in the harness and the gathering momentum and speed as the timber moves across the ground is mighty impressive. Gentle Giants Used for logging and riding, heavy horses are far from being merely museum pieces on four legs. Gilly Fraser explores the role of these beautiful animals in Cumbria today. Big logs at Tarn Hows The felling and extraction operation at the Lake District beauty spot of Tarn Hows in summer and autumn 2004 was carried out in often appalling weather, and in the full glare of publicity. It must rank as one of the most spectacular pieces of horse logging, or indeed of commercial horse work achieved in these islands in recent years. Moving Timber Simon Lenihan, winner of the British Horse Loggers' Woodland Management Award last year, spent his summer working on the Duchy of Cornwall estate, moving felled timber at Ladock Wood, Cornwall. Horse Power Meet the equine loggers of Lakeland Deep in the forests of Lakeland, an ancient partnership between man and beast is helping to make the world a greener place. The harvesting of timber and the maintenance of woodland areas usually involves machines.